Yesterdays session on composable infrastructure provided really good information from one of the industries strongest minds in this space George Weiss. He spent some time addressing some vendor differences addressing both HPE's Synergywith OneView and Dell EMC's Active System Manager. There were several key benefits discussed including simply assembled and managed building blocks, Incremental just-enough scale and capacity, dynamically integrated versus pre-integrated, enabling SDI and SDDC and reducing life cycle costs. 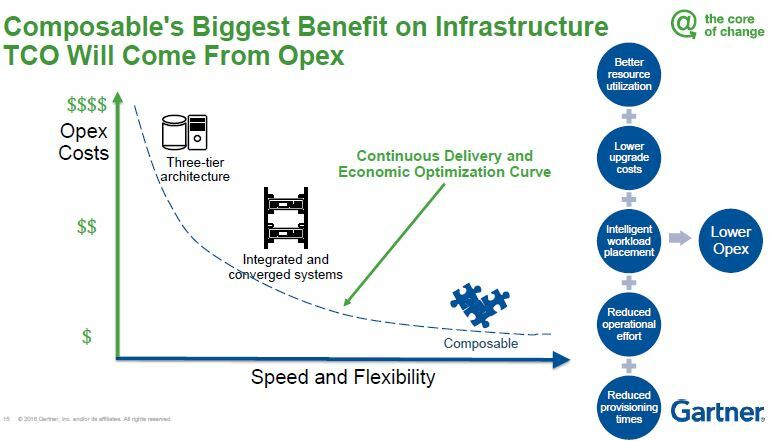 Probably the biggest benefits for customers are around reducing Opex and speeding time to value with infrastructure. While a lot of the industry call this space composable infrastructure we look at this on a much broader spectrum and talk about service defined infrastructure. Being able to compose dis-aggregated infrastructure is only a piece of the larger puzzle. For more information on service defined infrastructure see here. Note: Can be have shorter session titles next year? 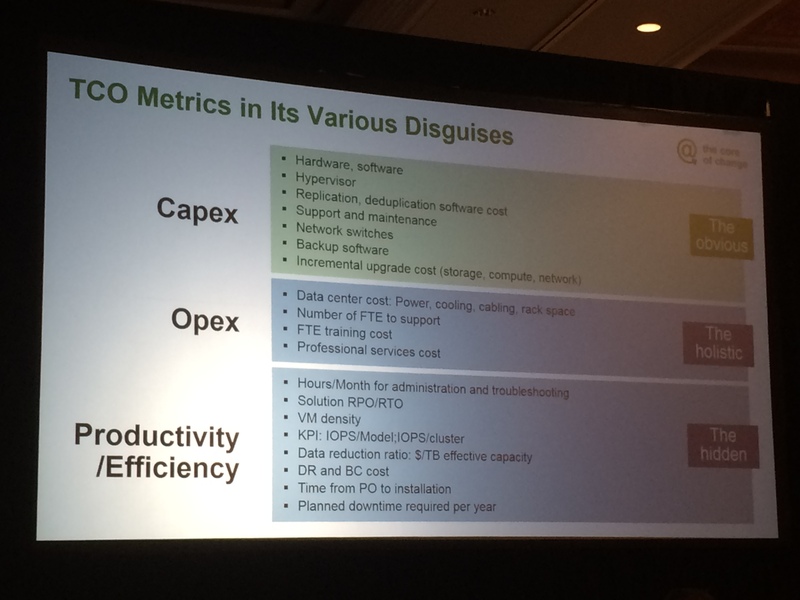 Dissecting the TCO of Software-Defined and Hyper-converged Systems vs. Traditional Architectures had some key insights that might seem obvious but aren't things we are always thinking about. With great flexibility comes great responsibility: I hope the comic book geeks like me appreciate this comment but it really is true. The biggest difference between software defined and HCI is that software defined gives you almost limitless flexibility BUT it puts all the responsibility on your shoulders. Where HCI is takes away those choices of what parts & pieces are used but you have single vendor support that will troubleshoot the environment not just a tiny part of it. Don't compare your old infrastructure to the most modern solution: With the sinking costs of storage and management finding something better than what you had is not a high bar to hit. As Julia Palmer said "you don't want to compare apples to bicycles"
There were also 2 great slides. The first is what to have in mind when you are comparing technology and the second is how to stay prepared for the next wave of tech whatever it is (AKA Julia's LAME cycle). 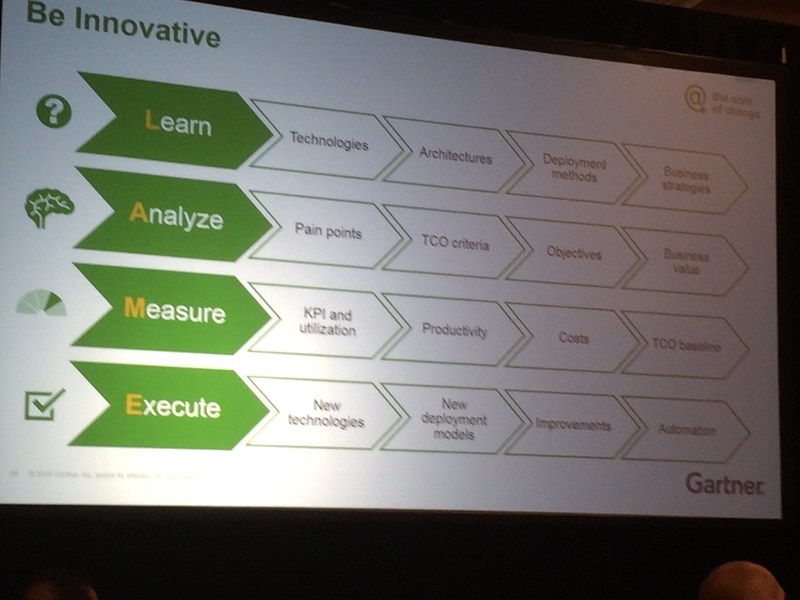 Here are my key take-aways from the HCI tech session that Paul Delory delivered. Overall, a great session from Dell EMC perspective where VxRail was highlighted as being on Gartner's "short list" for HCIS. VDI top use case for HCI. (No surprise there). Paul then “conditionally” recommended HCI for relational databases. Best used for proliferation of smaller databases. Cautioned that HCI data services don’t always work well with relational db’s and that relational db’s scale up and therefore often require just more storage (not CPU/RAM too) each time adding capacity.